Get little ones creating with this finger painting kit, offering four colors and unique fingertip brushes. This unique kit brings a fresh flourish to the familiar schoolroom art of fingerpainting. 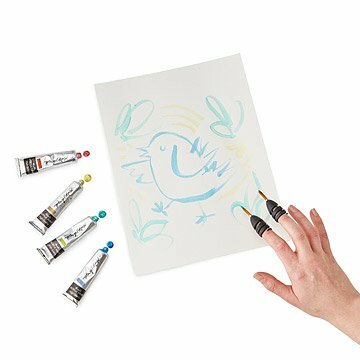 It includes four tubes of metallic paint and two innovative brushes that become extensions of your fingers, turning your every gesture into a lively, spontaneous line. The flexible, spiral design of the brushes ensures a comfortable fit for all sorts of fingers. Try one color at a time, or multiple colors at once! It’s a great way to encourage intuitive creativity in young and old alike. Made in Spain. Includes: 4 tubes of paint, 2 brushes. The child I bought these for had a blast. The colors are cool and the base of the kit can be used as an easel. Probably best for 6+ but if you don't mind really abstract art and can watch a younger child - let them have at it.